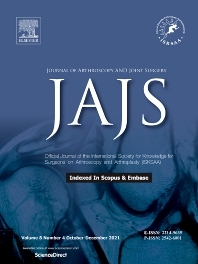 Journal of Arthroscopy and Joint Surgery (JAJS) is committed to bring forth scientific manuscripts in the form of original research articles, current concept reviews, meta-analyses, case reports and letters to the editor. The focus of the Journal is to present wide-ranging, multi-disciplinary perspectives on the problems of the joints that are amenable with Arthroscopy and Arthroplasty. Though Arthroscopy and Arthroplasty entail surgical procedures, the Journal shall not restrict itself to these purely surgical procedures and will also encompass pharmacological, rehabilitative and physical measures that can prevent or postpone the execution of a surgical procedure. The Journal will also publish scientific research related to tissues other than joints that would ultimately have an effect on the joint function.